Beautiful 4 Bedroom House with option of adding on a separate studio unit for a total of 5 bedrooms & 2.5 baths. 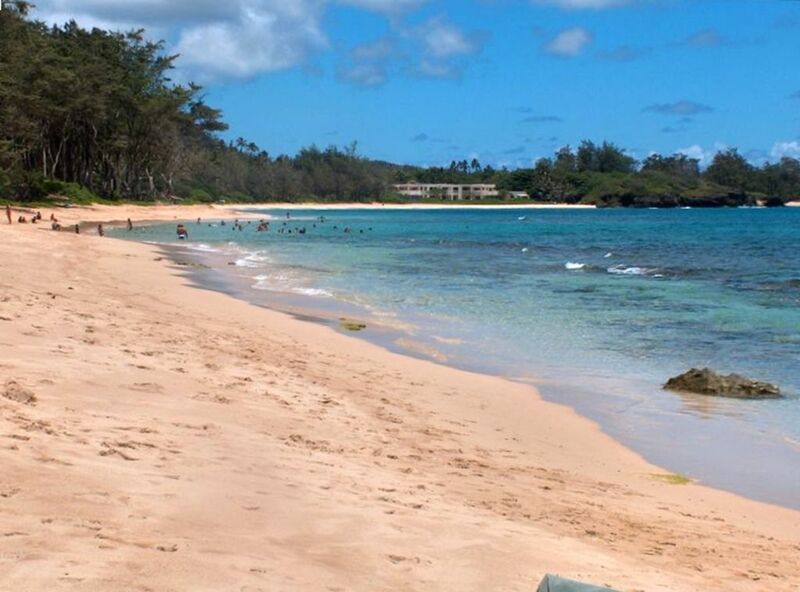 Located on the Northeast Shore of Oahu, on the border of Laie and Hauula. Safe beach for children & senior citizens alike. Endangered sea creatures call this beach 'home'. If you fish, dive or snorkel, there is good food in the water here. Bring your gear! Full Kitchen with dishwasher and cookware provided. Full sized coin-op washer on property, for your convenience. Walking distance to grocery store (food, liquor, supplies), eateries and post office. Minutes to Polynesian Cultural Center (a must-see for visitors and locals alike). Cable TV, DVD (movies available upon request, extensive catalogue). New Home Theatre Sound System! Steps to bus stop that will take you around the island. We are on the ocean side, NOT on the main road or across the highway!!! With our special rate, starting at $195 per weeknight (nonseasonal period), you will get a beautiful 4-bedroom beach house located on the Northeast Shore on the island of Oahu. Situated in a small and friendly local town, where everybody knows your name. Private access to white sandy swimming beach, known only to the locals. Disney movie with Even Stevens filmed right here on location. Ask your kids, they'll know. For more space and privacy, at an additional cost, we have a separate Studio unit with full bath and kitchenette to add on to our 4-bedroom home. Well, the 'size' is. The 4BR home sleeps up to 10 comfortably, depending on size and age. The separate Studio unit can sleep 2 people on one sofa bed with the luxury of an extra full bathroom. Where else can you find paradise fit for the whole family? We are two houses away from a secret white sandy swimming beach, a favorite spot for the locals in the area. Depending on the season, you may encounter various sea creatures that are protected under the Endangered Species Act. While we cannot guarantee this wonderful experience during your stay with us, the most recent sighting of the Hawaiian Monk Seal was in March & August this year on our beach. The Hawaiian Green Sea Turtle and the Hawaiian Monk Seal are very commonly sighted on this beach. During the winter months you may be lucky enough to witness, 300 to 400 yards from the shoreline, the Humpback Whales, as they migrate through to their next destination. A little further down the beach is a local favorite surf spot, Pounders. We are also minutes to famous attractions such as Polynesian Cultural Center, Kualoa Ranch, Chinaman's Hat, Crouching Lion, Haleiwa Town, Turtle Bay Resort Health Spa and Golf Course, just to name a few. This renovated, large two story, 4 bedroom beach home has a full kitchen and 1.5 baths with two reserved parking. With your one Lazy Boy Recliner Loveseat & one Sofabed (for use if needed with an additional fee), you'll want to stay indoors and watch television equipped with a home theatre sound system. However, the sound of the surf, mingled with the delicious aroma of bbq cooking on the grill will draw you outdoors. The upstairs master bedroom suite has a king sized bed with magnificent ocean views and vaulted ceilings. The full kitchen includes everything you need to prepare a lavish meal. All you'll need is your chef skills and the right ingredients. You can return home to the convenience of our outdoor shower. We also have a laundry room with a full size coin-op washer for your personal cleaning needs. An outdoor area where the kids can play and the adults love to barbecue. Be lazy and sit around the oversized lanai and front porch. Soak in the tranquil and soothing air as you relax while taking in the beauty of the mountains and coconut trees in view. You can relax and unwind, sipping mai-tais near the beach or take a scenic drive to Haleiwa Town at the North Shore or Windward Mall in Kaneohe. Either way is only a 30 minute drive. Walking distance, across the street, is our grocery shopping store, some eateries and our local post office. No need for a car. You'll find everything you need just minutes away. In addition, the Circle Island bus stops just several feet away to whisk you around the island, if you desire. Of course, down the road, on the way to Haleiwa, or even in the other direction, you'll find more lovely beaches to surrender to. If you're looking for something off the beaten path, tired of the crowded beaches and the hustle and bustle of city life, this is your calling. Keep in mind, Waikiki is only an hour away. This will definitely be a down-home local and truly 'Hawaiian' experience. Best rates available when booking in advance. Keywords: Beach House plus extra units for large families! toilet, Located on upper floor adjacent to master suite. toilet, shower, Located on main level. Views of the beach available from the lane in front of home or back areas of both homes. Our home is 2 houses from a swimming beach, on a private lane, with no major highways to cross. Beautiful mountain views from master suite. Mesmerizing ocean views from your master suite in the 4BR home. Full sized new coin operated washer, conveniently located in laundry room right outside your back door. $2 per load Laundry detergent can be purchased across the street at convenience store. Coin Operated $2 per load. Please adhere to washer and dryer use hours posted in laundry room. Two reserved parking stalls provided. For additional cars to park, please check with owner or park on the main highway. A bath towel, wash cloth & beach towel for each person is provided. Stainless Steel Dishwasher with Dishwasher Detergent provided in 4BR home. Dining table seats 4-6, depending on size. Large covered outdoor lanai with built in perimeter wood seating plus a table, perfect for entertaining & bar-b-queing. Board games and puzzles, upon availability. Small beach toys, upon availability. Situated on almost every block of the main road are many wonderful eating spots, such as the famous Giovanni Shrimp Wagon and for your fine dining pleasure, Roy's Oceanfront Restaurant at the Turtle Bay Resort. You can also experience the 'local grinds' that are sought after in this area. Such as the juicy Kahuku Super Sweet Corn, delectable prawns from the local shrimp farms, tasty Maki Sushi and Butter Mochi from Kaya's Family Store and delicious Ahi Poke from Kahuku Superette. This was our second time on Oahu and this beach house location simply can’t be beat. A private beach with excellent snorkeling is 30 seconds away. Our kids especially enjoyed hunting for crabs at night. The Polynesian Culture Center is only about a mile a away, along with many food trucks, restaurants and food trucks. It was also nice to have 2 parking spots. The beach house is a bit dated and at times we wish we had two showers. The outdoor shower was awesome though to get all the sand off before going inside. The kitchen has everything you’ll need including a dishwasher, range, refrigerator space, plenty of pots and pans, knives. Owners was super responsive and amazing at communicating with us. This home is in a prime location! Super close to the beach, a drug store and a grocery store; all with in walking distance. On a quiet street with easy access to the beach. The front lanai was large and great to relax on, we spent most of our time there. Sunrises on the beach were hard to beat. Great place to rent if you are looking to be away from the hustle of bustle of Honolulu. This home was perfect for our group of 7 single adults. Had everything we needed and in place that is near a beautiful ocean entrance. Was clean, great instructions for everything and a bit dated which gave it charm. When we had an issue (created by us) Keali'i was there is a flash to help us. Can't say enough about the aloha spirit that Geri and Keali'i live by - truly wonderful hosts. Wonderful beach walk and close to shops and the Polynesian Cultural Center. Our family (5 adults, 5 kids, 2 babies) enjoyed our stay very much! The house is large enough for everyone to have space to relax; the front lanai was a natural gathering place to BBQ and visit around the table. Each bedroom was well-equipped with comfortable bedding and pillows and there were an abundance of beach and bath towels provided. The master bedroom upstairs was a very nice getaway! The kitchen is well-equipped and it was nice to have some pantry items from previous tenants to use; the market across the road was super convenient, as was the Long's Drugstore, post office, and yummy local food spots for burgers and tacos! The home truly is just steps from the beach, and that is where we spent most of our time. Our grandchildren range from 18 mos to 11 and there was something for everyone! The kids swam, snorkled, and boogey boarded to their heart's content. Beautiful sand with some nice shady spots for the keikis, it was lovely. Bring water shoes and snorkle gear! The fish were abundant and vibrant, rivaling any of the more famous snorkle spots on Oahu. The children couldn't get over how many kinds of fish there were, and made some great memories there. The owners are very, VERY attentive and close by if you need anything. All the rules of the house are clearly posted in each room so you can really enjoy your stay. We would recommend this affordable, very casual and comfortable home to family groups who want a no-fuss place close to an amazing beach! Perfect location, quiet and relaxing. Amazing beach. A very memorable stay. The beach house was lovely, we had 9 adults and three babies and it was super cozy. The beach was one of the best I’ve ever been to, quiet and remote, no wall to wall people. Ke’Alii and Geri were wonderfully accommodating. The coin operated laundry facility on site was a blessing too. Just an all around excellent vacation rental and area. I highly recommend it. Mahalo Geri and Ke’Alii! Great little beach house, close to awesome beach. Quiet and local area. Landlords are awesome and very helpful. Had everything we needed like beach towels all cooking tools! Nice front seating area. Would highly recommend ! Additional fee of $50 per person over 10 people, regardless of age. No parties or events. All overnight guests must be included in the reservation and must be registered with the owner prior to arrival. No pets allowed. No smoking inside the home and smoking allowed only in designated smoking areas.